Systems engineer Andy Sottile was always willing to try something new. From a perspective derived from seven decades on this earth, I have come to view my survival through 50-plus years in the music business as an extremely providential and fortuitous outcome. Furthermore, I am constantly amazed that the life path I chose, based on decisions made as a teenager, is still sustaining me after these many decades. However, there is a darkly negative aspect to establishing such a long career in touring audio. Too often I have been experiencing jabs of sharp pain from seeing so many of my road crew contemporaries leave this world far too soon. A while back, I wrote a column in this magazine in which I described a syndrome that seems all too prevalent among the men and women whose primary work in the music business keeps them on the road. Many of us have a misplaced belief in what I labeled as “The Myth of the Invincible Roadie” — how each day, we seem to take our health, strength and mental agility for granted — all the while working crazy hours on the sometimes equally crazy tour schedules that are so much a part of our nomadic lifestyle. We who subscribe to The Myth may neglect our most basic healthcare needs or choose to ignore warning signs from our bodies that everything may not be okay. I readily admit that I was a believer. Hell, the show must go on… but time also passes relentlessly. Alarmingly, at this stage of life, events are now taking place with increasing frequency that directly assault that myth of indestructibility and easily puncture any veil of physical complacency. One such jolting event occurred just days ago when my longtime partner at the FOH position, Andy Sottile, succumbed to his personal battle with cancer. His passing has been a deep body blow from which I am still reeling. Our partnership began with the 2000 Steely Dan Y2K tour. Since that first tour, Andy (AJ) Sottile had traveled the globe with me in tow while expertly performing his duties as Clair Global’s audio systems engineer and audio crew chief. In those subsequent years, Andy and I teamed up for many more extremely rewarding and technically successful worldwide tours. The track record we established over the course of those 18 years speaks for itself. Andy worked closely by my side as we traversed the planet with Paul Simon, Simon & Garfunkel, Bette Midler, Stevie Nicks, Steely Dan, James Taylor and the Troubadour Reunion tour with Carole King & James Taylor. 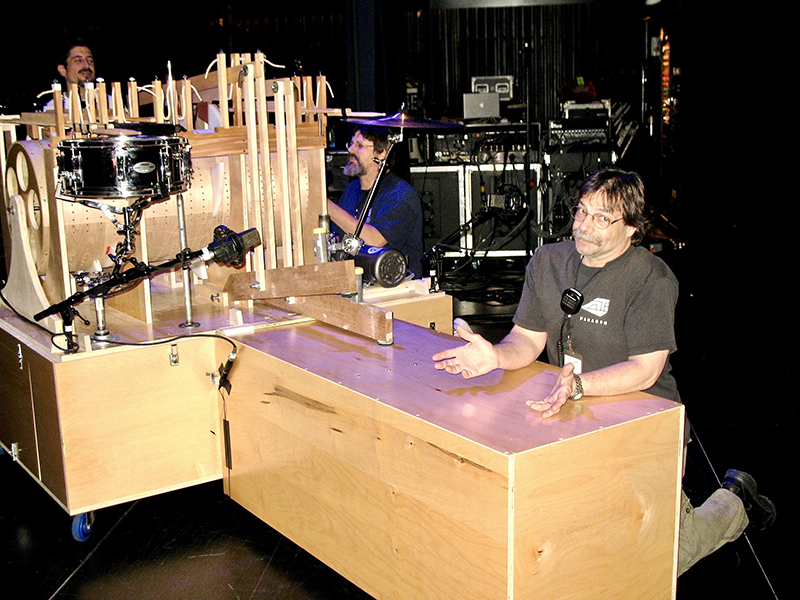 Of the 10 TEC Award nominations my career has been blessed to receive for excellence in touring audio, Andy Sottile was the systems engineer on six of those projects. Clair Global and I were fortunate enough to win that award for our work with Steely Dan in 2000/2001. Much of the credit for that singular accomplishment goes to my friend and co-worker, Andy Sottile. Andy’s passing has caused me to more deeply reflect on the systems engineer/FOH mixer relationship — a dyad that has grown greatly in significance over the years. As sound systems have increased in complexity and computer controlled processing has replaced seat-of-the-pants, hands-on operation, the systems engineer has acquired more and more responsibility in the deployment and manipulation of the various components of a modern audio system. For members of Andy’s (and my) generation, any remaining connections between old methodology and new technology have rapidly become more tenuous, and the technology gap between older generations of audio gear and the newer, computer-controlled line array systems has been growing wider with each passing year. But Andy Sottile always made sure he was thoroughly informed of changes taking place in Lititz and confident about successfully operating any of Clair’s various proprietary systems. In my corner of the world, it was a given that Andy would constantly update his internal database as new technology was added to the Clair system inventory. In turn, he became the interface that kept me current with the changes in operating procedures. Following the path of innovation from Clair’s design engineers, Andy and I navigated our way through S-4s, R-4s, i-4/i-4B, i-5/i-5B, i-3s and Cohesion 12s — and many, many successive generations of rigging systems, cabling systems, amplification systems and audio control systems. Though he was often quietly reserved, Andy Sottile was passionate about live audio and remained a student of sound system deployment and control throughout his professional life. Beginning his career with Clair Brothers Audio in 1985, Andy was comfortable at both ends of the snake. Andy’s skills as a monitor engineer were well known. When he decided to focus his energy at front of house as a system engineer, he had found his true calling. I may be the person who benefitted most from that particular career choice. Andy Sottile was often calmly understated, camouflaging a confidently knowledgeable and insightful man. His business-like, straightforward demeanor manifested his inner strengths and his on-the-job attitude was consistently positive and focused. In many ways, Andy was the obverse of my work personality. We were definitely yin and yang, but we were anything but incompatible. Where our opinions and experienced meshed, the merging of our individual talents was extremely robust. At the end of the day, even our differences of opinion tended to produce better solutions. Our complementary personalities became an extremely formidable combination at FOH that lasted through hundreds of shows with the legendary artists for whom we were lucky enough to serve. Being opposite poles of the same magnet, we very often filled in the holes in each other’s expertise and knowledge bases. I tend to inhabit a far more theoretical space. Andy was far more securely grounded in the practical universe. If I asked “What if?” then Andy would say “We can do it this way.” My world is consoles, control systems and outboard gear. Andy’s world was black boxes, rigging and copper. Where our worlds intersected was that special place where the magic happened. One personality trait we definitely held in common was the belief in ourselves as musicians first and sound engineers second. Andy was a bass player before he veered off into live audio. He would often wax poetic about his favorite Telecaster bass guitar. I was a guitar player/singer in my previous life. As musicians who grew up with similar tastes, we tended to agree about the goals we hoped to achieve and the results we were able to elicit from each of myriad sound systems Andy and I saw during our years traveling together. We developed a level of trust in each other’s abilities and sensibilities that produced a profound faith in our potential to consistently deliver the highest quality audio product. Although it is often a very subjective and artistically amorphous judgment, early in our partnership we found out that we generally agreed on the qualities in a mix or the output of an audio system that constituted “good sound.” As we shared that common definition, I intrinsically trusted any input I received from Andy before, during or after the show. We were both passionate about giving the audience the best possible concert experience. I always had complete confidence in any adjustments Andy would make to the system during the show. On our first few tours together, Andy was joining the crew on tours with clients I had previously been mixing. Steely Dan, Paul Simon, Simon & Garfunkel and Bette Midler were all long-term associations for me. Andy’s individual high level of competence was always evident and his ability to both direct and represent the audio crew was also immediately apparent. But it wasn’t until I joined a tour on which Andy had preceded me as a crewmember that I saw the full extent to which his personal presence could expand. During our first years together, I had to share Andy’s services with the James Taylor tour. I must admit to certain feelings of jealously that Andy would commit large blocks of time to another touring aggregation. However, when Mr. Taylor called me 15 years ago and invited me to join his touring family, I finally discovered the complete manifestation of our friend, Andrew J. Sottile. The James Taylor tour was Andy’s true home base. James and the band loved him equally as much as the crew. It was immediately apparent that Andy was the true anchor bolt on the tour. He was both the respected elder and the moral conscience of this diverse group of talented individuals. The JT tour was definitely where Andy left his permanent mark on the touring audio world. There is no question that our crew was molded in Andy’s image. I have always been so proud of becoming a long-term member of that road family, and to have been initially sponsored to take over the FOH engineer position by Andy Sottile. What I admired most about my now-fallen brother was his natural ability as a leader and influencer. At most times, Andy was a soft-spoken person, but he communicated with quiet assurance and strength of will drawn from his years of sound reinforcement experience. Frequently, his words were few but his intent was always clear. Andy was a man of concise and considered utterances, parsimonious with his words but generous with their meaning. A co-worker described him as “A man of few words, his wry laughter and one-liner jokes spoke more than most people could say in a day.” I will never forget that particular sideways look that always spoke so eloquently. I miss you, my friend. Longtime FRONT of HOUSE contributor David Morgan is currently mixing FOH on the Fleetwood Mac world tour. Look for “A Personal Note, Part 2” in an upcoming issue.